Green outdoor living is all the buzz in the home renovation & construction industry. In case you’re looking for answers on how to build an eco-friendly deck or patio, we’ve got answers! This is the second in a 2-part series of articles on how to construct a green outdoor living space. Today we answer the remaining 4 of the top 7 questions we hear from homeowners who are considering building a green outdoor living space. Please check out “Part 1 – Tips to Build an Eco-friendly Deck or Patio” which has the first 3 questions in this set. 4) What materials should be used in green outdoor projects and in what climates? Answer: We recommend composite decking products for decks and outdoor living structures in all types of climates. Also, structural elements built with pressure southern yellow pine. Archadeck uses Trex, Fiberon and TimberTech eco-friendly products in our outdoor living space projects, and our customers have been extremely satisfied with the materials and look. 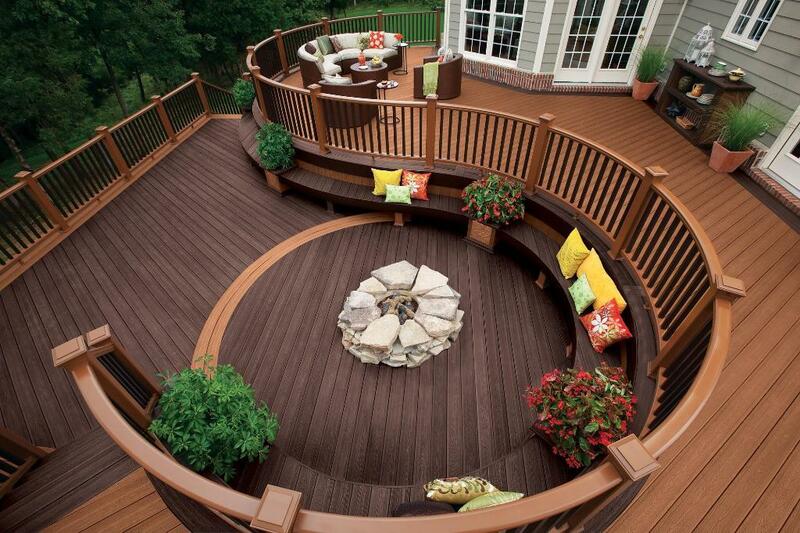 There is a growing trend of composite decking products made from recycled, high-density polyethylene (HDPE). Eco-friendly decking and patio products are more natural-looking than ever before, and have better warranties than in prior years, including fading and stain resistant. Top manufacturers are supplying green and high-quality, repurposed decking materials for the industry. 5) What can you do to maintain and power wash/clean an eco-friendly deck? Answer: We highly recommend Renew Crew, our sister company with locations nationwide, that uses eco-friendly products. They help property managers and homeowners maintain their outdoor projects so that they keep the beauty and protect it. The products Renew Crew uses are proprietary and are made for use with their 3 step process. Pressure or power washing is great at removing surface dirt quickly. For a deep, long-lasting clean, there’s nothing better for your outdoor surfaces. Unfortunately, if done incorrectly, it can also quickly gouge your surfaces, leaving irreparable damages to your home or deck. If you want a true, deep clean — with no risk of gouging — nothing beats a Renew Crew Clean. 6) What type of layouts or designs work well for eco-friendly outdoor spaces and why? Answer: The latest generation of eco-friendly products can be used in all applications, so the design of your deck really depends on the existing structure of the building and landscaping and want type of space you want to create. Where possible, deck floorboards should be installed diagonally for added structural integrity and visual appeal. (If a parallel or perpendicular decking pattern is desired you can incorporate a diagonal brace below the deck frame.) Boards are typically screwed or installed with hidden fastening system rather than nailed. Be sure to design and construct around specific functional issues in your outdoor space. Wherever possible, wood grain should be aligned perpendicular with the traffic pattern to reduce the opportunity for splinters on bare feet. If a hot tub is planned, a multi-tier design is often recommended for aesthetic appeal and ease of access to both the tub and control panels. Interesting angles are employed on most deck designs to avoid an unimaginative, “boxy” appearance. 7) How should property owners determine the size of the deck? Answer: Think about how you want to use the space and how use of that space may need to change over time. You will need to balance function, aesthetics and budget in implementing your outdoor project. You can discuss the size and layout with a contractor or deck builder. The most important advice I can give is to employ a quality, reliable contractor who specializes in outdoor living spaces, is insured and licensed, and who is knowledgable of national construction codes. It’s official: Survey says that more American homeowners are adding outdoor rooms to their property! 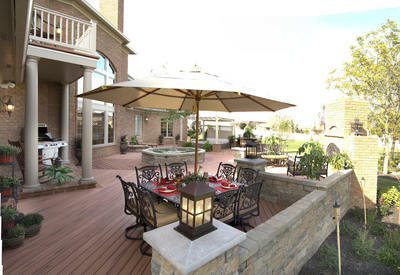 Here at Archadeck, we agree with the survey results and anticipate to see a high demand for these outdoor living features in 2013, with importance placed on function, durability & aesthetic. Coming up this weekend, Friday March 9th – Sunday, March 11th, 2012 is the return of the popular Suburban Maryland Spring Home Show at the Discovery Sports Center at Maryland SoccerPlex in Germantown MD. Admission is free (you can print a free pass from their website) and our company, Archadeck of Maryland, will be exhibiting at booth #624. 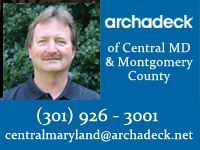 Be sure to stop by the Archadeck of Maryland booth to check out pictures of our latest projects, find out more about our products and services, and ask our experts any questions about your upcoming home project. We look forward to seeing you at the home show! Coming up next week is the annual Washington Home & Garden Show at the DC Convention Center! Starting Friday, March 9th through Sunday, March 11th, 2012 you’ll be able to see HGTV celebrity experts in person, check out the latest in outdoor living trends and get inspired for your spring gardening & home projects! Archadeck of Maryland & Archadeck of Northern Virginia will be exhibiting at booth #1437, so be sure to stop by our booth to check out the latest in outdoor living trends, see examples of our top-notch work in the region, including custom built decks and outdoor spaces, and feel free to ask questions about your own upcoming design project to our experts. Celebrity guest Ty Pennington from HGTV, ABC Extreme Makeover: Home Edition, and ABC The Revolution (appearing Sat. 3/10 at 2:00pm). To see the complete schedule of stage presentations time/dates, click here. Celebrity guest Todd Davis of HGTV’s Room Crashers (appearing Sat. 3/10 & Sun. 3/11). To see the complete schedule of stage presentations time/dates, click here. Celebrity guest Sasha Andreev from HGTV’s Curb Appeal (appearing Fri. 3/9 & Sat. 3/10). To see the complete schedule of stage presentations time/dates, click here. Local garden expert and publisher/founder of Washington Gardener Magazine, Kathy Jentz (appearing Sat. 3/10). To see the complete schedule of stage presentations time/dates, click here. Sarah von Pollaro, founder Urban Petals Floral Design, whose designs have adorned the White House, the Kennedy Center, and the Macy’s Flower Show (appearing Sat. 3/10). To see the complete schedule of stage presentations time/dates, click here. Innovation Avenue – check out the newest products in home decor, kitchen & bath, outdoor living & more! Glorious Gardens – Stroll through 16,000 sq feet of gardens and see the latest trends in landscaping & outdoor living. In the feature gardens you’ll be able to experience 6 movie-inspired gardens, designed by the area’s premier landscape designers! Tickets will be sold at the door (Adults $12; Children Ages 6-12 $3; Children 5 and under: FREE). If you’re in the DC area and have an upcoming outdoor or home project you’re planning this spring, be sure to stop by the Washington Home & Garden Show next weekend. We look forward to seeing you there! Make a list. Putting your home & design projects in writing and making a timeline is a great way to start tackling your new project and clarifying any desired features, specifications, intended use, and goals for the finished project or living space. Collect pictures of projects for design ideas. Clip pictures from magazines, start a virtual pinboard on Pinterest, or find a way to collect photos that help you visualize your desired end result. Ask for referrals. 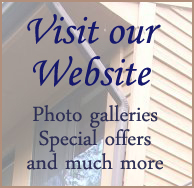 Word of mouth is a good way to start when finding a good contractor or renovation specialist. But don’t just ask friends and neighbors in person; be sure to check websites like Angie’s List, Yelp, My Neighbors Network (covering Maryland and Northern Virginia), the Better Business Bureau, Consumer’s CheckBook, etc. or look for testimonials on a company’s website. Check contractor for accreditation, to make sure they are licensed and insured. This information can be found through your state’s department of labor. In Maryland you can check the Maryland Department of Labor, Licensing and Regulation website to search for contractor licenses here. You’ll also want to make sure a company is insured and verify their warranty protection. Schedule in-home consultations. Start the process of getting quotes and scheduling design consultations so you can get a feel for a company or contractor before making a commitment. Take these simple steps to get your project on track and leap into spring with a new outdoor living space to enjoy. If you’re thinking about building a new deck, 3- or 4-season room, sun room, screened porch, patio, trellis, pergola, arbor or fire pit at your home in Montgomery County, Howard County, Anne Arundel County or Prince Georges County MD, give us a call to discuss ideas. Our design consultation is free. Give us a call at 301-926-3001 or email us to schedule yours today.